Triton continues to develop and innovate with new power tools and the Plunge Track Saw is a good example, which we decided to try out for ourselves. This machine has quite a lot in common with several other brands in terms of capability, but at a very attractive price. 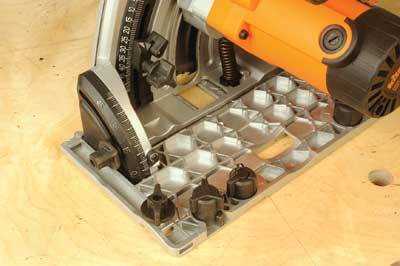 It can perform several useful sawing functions. It is primarily a track saw, with the track and connectors allowing you to accurately cut from man-made boards, right up to full-size sheets. It can also plunge, making it ideal for stopped cuts and gaining access under floorboards. 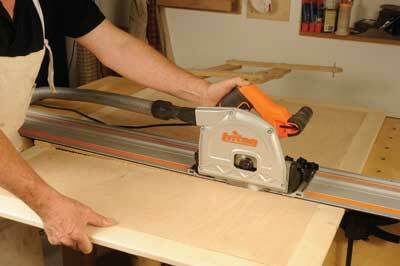 It can cut close to perpendicular surfaces so it will do jobs like door trimming for example. Finally, at full depth it can crosscut standard sections, such as 100 x 50mm softwood, thus making it a good all-rounder. The standard blade is a fine cut 60 tooth TCT, so if you want to do heavy ripping, a coarse blade is needed, but that isn't what this saw excels at. An interesting feature is not only to be able to preset cut depth using a sliding stop against a scale, but also to change blade position in three ways: one, a lock for blade changing with the Allen arbor bolt easily accessed: two, full plunge to a preset depth and; three, pre-scoring depth. This latter allows a very shallow pre-scoring cut to prevent spelching when making a cut, especially across the grain. In addition, the saw can be tilted and a flip out foot gives stability in this mode. 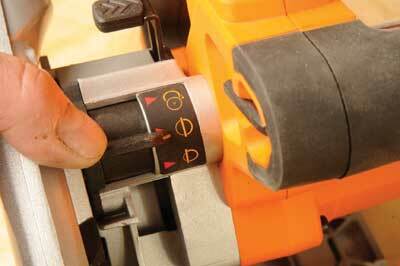 When mounting the saw on the track for the first time, the flexible edge is trimmed off to give a true edge to set against intended cut marks. The saw base can be adjusted to tighten the fit on the track and there is an anti-kickback device as well. Triton can also supply a track carrying case, track clamps and connectors, making for a complete setup when teamed with an auto extractor.